Forty million people a year use Pinterest to plan for their wedding. If you’re in the wedding industry, Pinterest needs to be one of the networks that you focus on. To start getting a sense of what Pinners explore in wedding topics, look through the wedding category. Wedding cakes alone has 896.3k followers. These categories and boards amount to a wealth of insight into what users want out of their research when they’re planning a wedding. 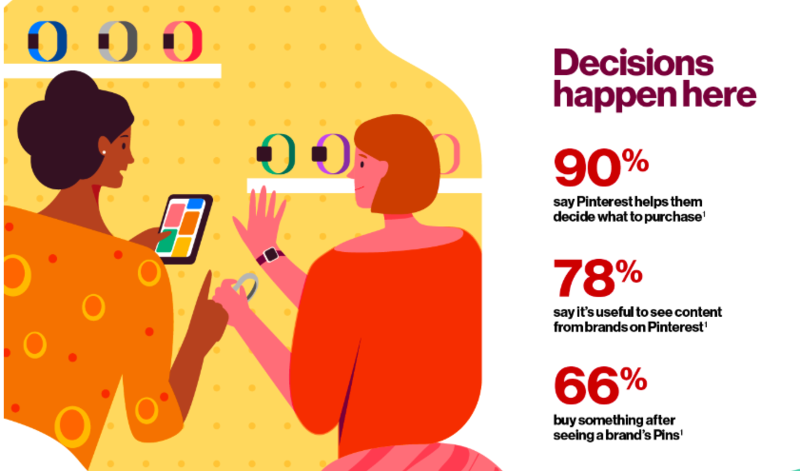 It represents a great opportunity for your brand to connect to these needs and make sure you’re as visible as possible to this valuable segment of Pinterest users. There are many ways you can approach your Pinterest marketing. For starters, let’s learn a little more about who is doing their wedding planning on Pinterest and how they use it. Who’s on the network and when are they most active? According to Pinterest’s own data, the busiest planning months are January to March with Pinners beginning their research earlier than non-Pinners. In fact, 81% of engaged Pinners say they started planning on Pinterest before they were even engaged. This means that your business has the opportunity to inspire at the earliest stage of the consideration process. In case you’re worried about brands taking over Pinterest, Pinners are actually very receptive to brand Pins. Seventy-eight percent of Pinners say it’s useful to see Pins from brands and 66% buy after seeing a brand’s Pins. This is a great statistic to keep in mind as you explore Promoted Pins. Once people start planning their wedding, 27% of Pinners will plan several times a day, compared to 18% of non-Pinners. This means you have a great chance of reaching this highly engaged group with organic and paid Pins. In all, the network boasts 900 million Pins about weddings and 378 million wedding-related searches per year. That’s an extensive library of inspiration. 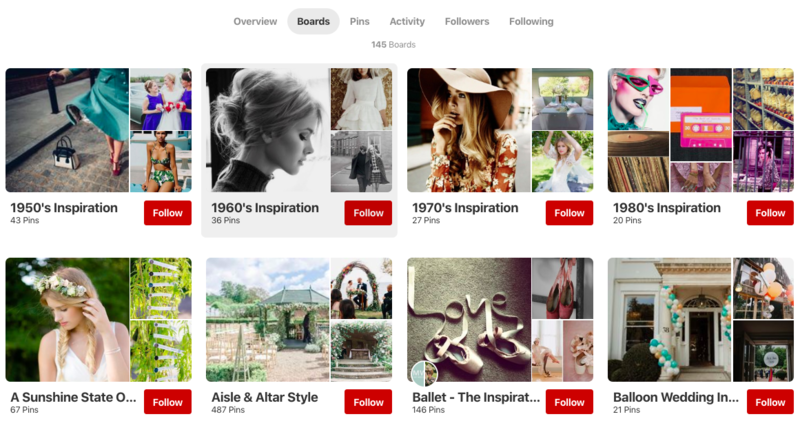 Pinterest’s image-forward style is perfect for the wedding industry because Boards serve as sources of inspiration. Boards can be created for every stage of a wedding: engagement announcement, wedding shower, bachelorette party and even guest gifts. With the addition of the Section feature, Boards can also be broken down into Sections. For example, a stationery Board could potentially have Sections for style inspiration, wedding invitations, guest list display boards and thank you cards. As Pinners plan, they start to move from gathering visual & stylistic inspiration to vendor research. The boards they create are useful at all stages of the process, whether they’re shared among friends, such as for bachelorette party ideas, or with vendors, such as identifying engagement shoot photo styles. Pinners spend 29% more on retail than non-Pinners and of those, 39% are more likely to be active retail shoppers. Having Pinterest-friendly items on your site and shop is a good first step in getting your products in front of potential customers. Now that you know who uses Pinterest and how they use it to plan for their weddings, the next step is to make use of that knowledge. Whether you sell services or products, the very minimum you can do is set up your profile and optimize your website. Both of these tactics will give you a kickstart in your Pinterest marketing. Setting up your profile to sell on Pinterest is a multi-step process. Have a claimed website: Pins that come from your website will automatically include your profile photo in them and show up in your website analytics. This Board is clearly for bouquets and its short description is written to target brides who love vintage items. Second to having your profile complete, the next most important part of reaching more customers on Pinterest is to have a Pinterest-ready website. Most of this is easy to implement with some time. It goes without saying that your website should include the icons of the major social networks that you’re on. Take it a step further for Pinterest by adding share buttons. Pinterest has their own code-ready Save Button that you can easily insert into your website. Depending on which platform you’re on, plugins may already exist to help with the Pinterest account connection. This blog post has images that, when magnified, include easy social sharing buttons. If you sell buyable products or services online, take the time to add Buyable Pins. Consider this another channel where people can purchase your products. 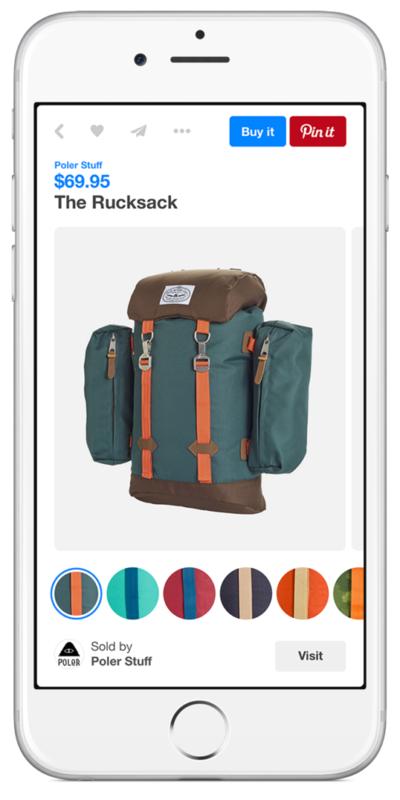 Customers can easily shop through Pinterest without ever leaving the site. For wedding vendors that show off a portfolio of accomplished works, adding Rich Pins will be another Pinterest marketing enhancing step. Article Pins will highlight the headline, author and short description in the Pin. Finally, each landing page and post needs to have at least one Pinterest-optimized image. This means the image dimensions itself are within recommended guidelines and that the descriptions have the necessary keywords. Create a rhythm in that for every blog post you publish, you simultaneously schedule your Pins from the post. If you have multiple images in the post, don’t be afraid to use them all. 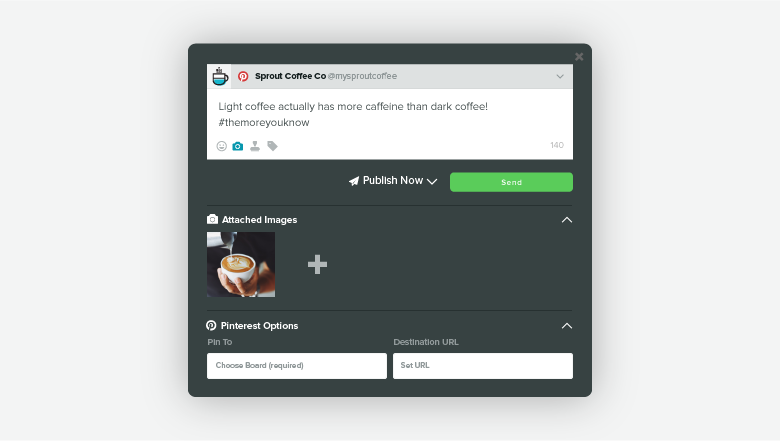 Sprout’s ability to schedule Pins means you don’t need to leave your all-in-one publishing software to work on Pinterest. Search for Pins and queue them up to publish while you’re busy working on something else. As you scroll down this Beach Weddings Board, you’ll notice that some of the titles are the same. Multiple Pins lead to the same blog post but because the photos are different and apply to the Board’s topic, it doesn’t look repetitive to a fellow Pinner. Take your Pinning a step further by creating multiple topic Boards to increase your SEO. A Pin that was used on a Beach Wedding Board could also be a candidate for a Peach Wedding Color Board. Rock My Wedding has multiple inspiration Boards targeted at various wedding Pinners. There are decade Boards, color Boards and even specific ones like Chair Decor. Think of how your company can help put Boards together to inspire Pinners in every detail of their planning. Pinners are more receptive to advertising than on other networks. For every $1 in advertising spent, $2 is earned in profit. By promoting your Pins to targeted groups, you’ll directly reach those who are most interested in purchasing your product. 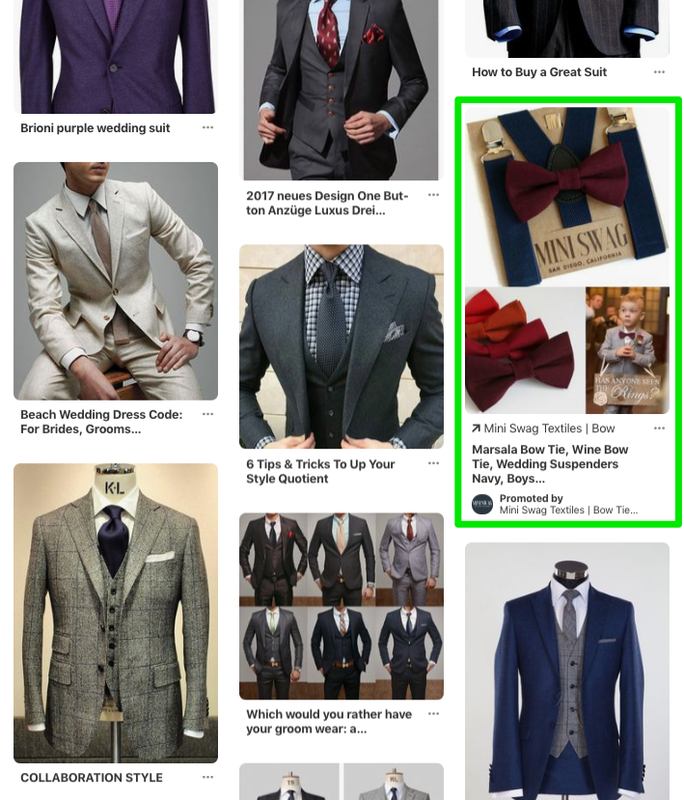 When searching for wedding suits, this ad appeared, almost seamlessly blending in among the rest of the related Pins. Elegant Wedding Invites added a Pinterest-only discount code to their bio. 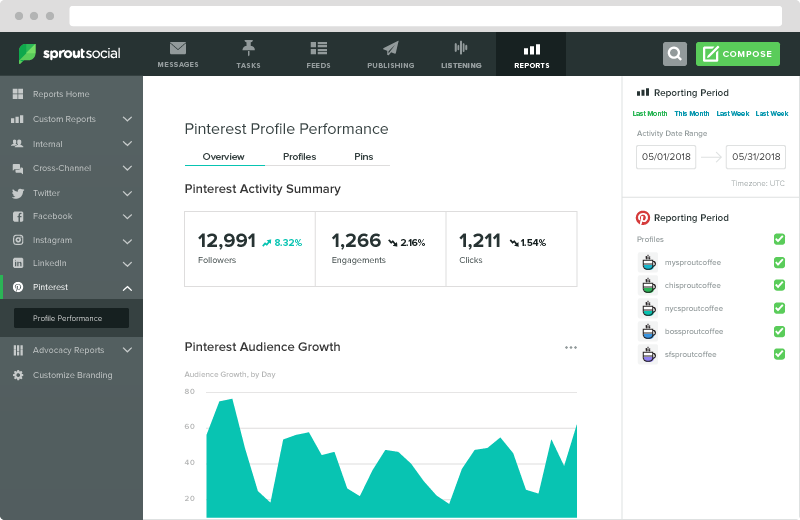 Between tracking their website referral traffic and the code, the company will be able to see how successful their Pinterest account is. 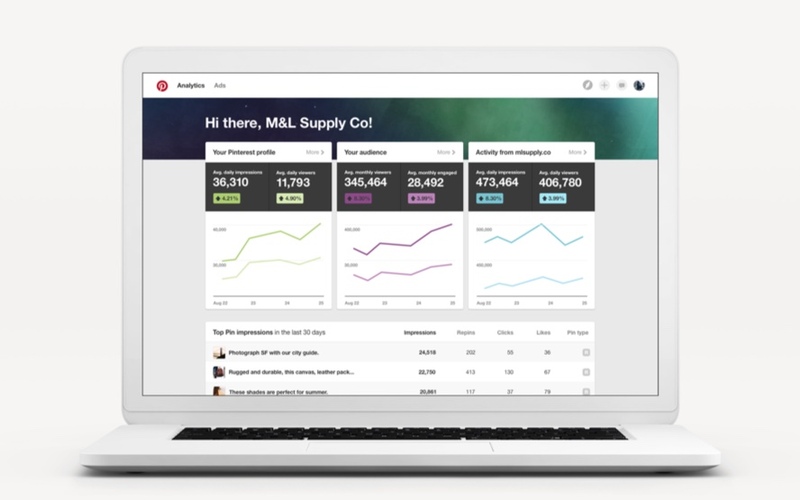 Pinterest recently launched a free, application-needed Pinterest Propel program that helps businesses navigate their advertising. Those participating in the program have seen up to three times more clicks on their ads than non-participants and up to a 15% lower cost per click within the first 90 days of the program. If you’re unfamiliar with Pinterest advertising but want to test it out, Propel might be a good option for you. Don’t be afraid to experiment with your ads. Helpful wedding Pins like checklists and infographics may not lead to an immediate purchase but the brand will remain in the back of a Pinner’s mind if that informative content helps them make decisions. Learn more about how to enhance your Pinterest advertising in our guide. With your Pinning schedule strategy down and your website claimed, set aside time to examine how well your account performs. Because Pinterest is more of a brand awareness platform, it may take a little more time to build up traffic to your site. With consistent Pinning and a little patience, you’ll start to see more engagement. With a Sprout account, you’ll dive a little deeper into analytics and see which Boards are receiving the most attention and which ads are working in your favor. Pinterest is a treasure trove of potential customers for the wedding industry. From stationery designers to florists, the network is filled with Pinners seeking inspiration and products. If you only want to dip your feet in without committing to the network, work on your profile and optimize your website. Sit back and see what people are finding on your site and what content is the most popular. The next ambitious move would be launching a small advertising campaign. Ted Baker included Pinterest in their wedding line launch. 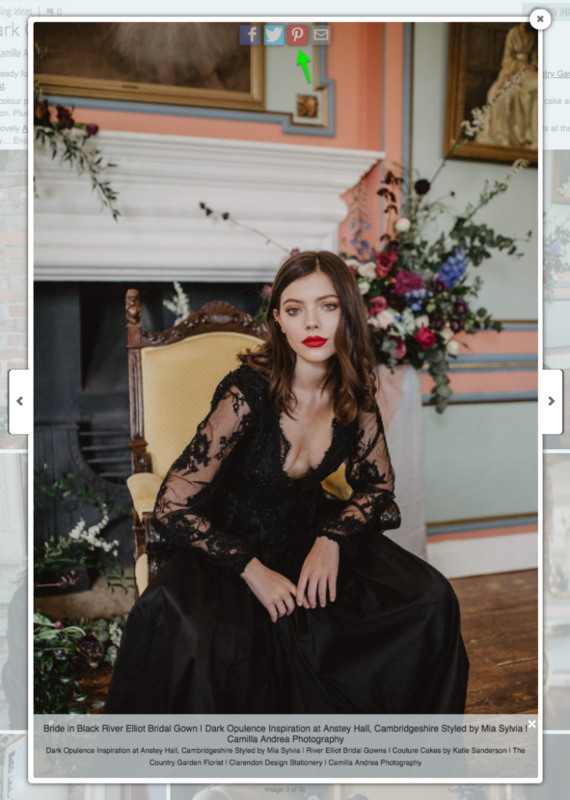 With a combination of editorial content promoted Pins and in-store Pincodes, they generated over 800 visits to the campaign’s landing page and over 400 in-store wedding consultations. Investing a little time and money into developing your Pinterest account will go a long way for wedding vendors. The opportunity is endless for reaching potential customers.